Be the first to share your favorite memory, photo or story of Eulah. This memorial page is dedicated for family, friends and future generations to celebrate the life of their loved one. Eulah Bass Neal, 95, passed away on Saturday, October 20, 2018 at Wayne Memorial Hospital in Goldsboro, NC. The family will receive friends on Wednesday, October 24, 2018 from 9:30 – 10:30 a.m. at Seymour Funeral Home followed by a graveside service at 11:00 a.m. in Wayne Memorial Park, Goldsboro, NC. 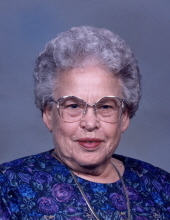 Eulah was born in Fremont, NC on November 12, 1922 to the late Joshua and Virdie Bass. She was married to the late Bruce Arlington Neal. She graduated from Fremont High School and worked at Goldsboro Union Station as a ticket agent and telegraph operator for the Atlantic Coast Line Railroad. After her service with the railroad, she volunteered with the American Red Cross as a nurse’s assistant and later worked as a Long-Term Nursing Care Assistant at Guardian Care of Goldsboro. Eulah is survived by her son Jerry Lee Neal and longtime fiancée Lisa Lamm of Goldsboro. In addition to her parents, Eulah was preceded in death by her sister, Myrtle Linda Bass and brothers, Lee Franklin Bass, Hubert Stevenson Bass, Milford Luther Bass and Erskine Woody Bass. The family would like to thank the staff of Goldsboro Assisted Living for the care of Mrs. Eulah Neal during her time there. In lieu of flowers, memorials may be given in Eulah’s memory to the Northview Baptist Church, 600 Patetown Road, Goldsboro NC 27530. To send flowers or a remembrance gift to the family of Eulah Bass Neal, please visit our Tribute Store. "Email Address" would like to share the life celebration of Eulah Bass Neal. Click on the "link" to go to share a favorite memory or leave a condolence message for the family.